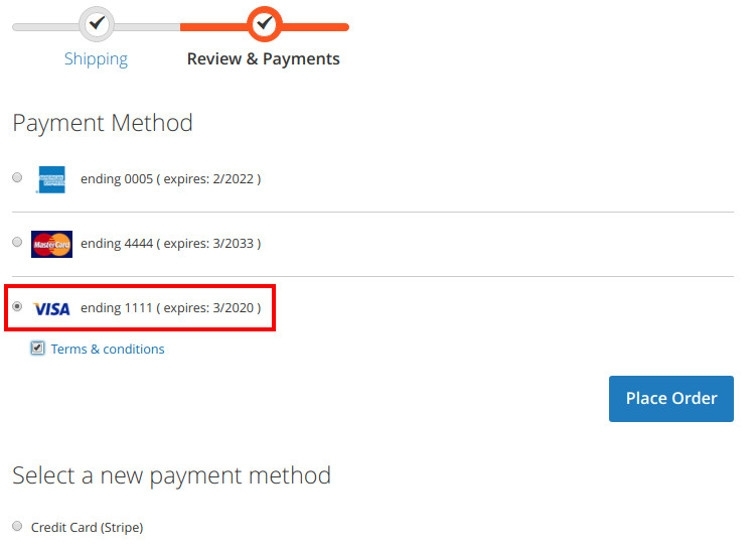 Magento 2 Blog - Mageside - How do Stripe payments work on Magento 2 store with Stripe Payments module? Stripe is a potent tool in online business. It combines all the necessary functionality for making manipulations with digital money and at the same time is extremely simple. Stripe is a secure platform for protecting your clients' credit and debit cards. The Stripe payments extension works with most of credit and debit card types, namely Visa, MasterCard, Discover, American Express, JCB, and Diners Club. It also supplies PCI compliant and safely payments of your web store. Stripe can collate on your behalf all credit card data. PCI (Peripheral Component Interconnect) is the standard of information security among a lot of organizations and Stripe has the highest rate of PCI certification. Stripe achieve PCI compliance for your payments due to the implementation of Stripe client-side tokenization in Stripe Elements. 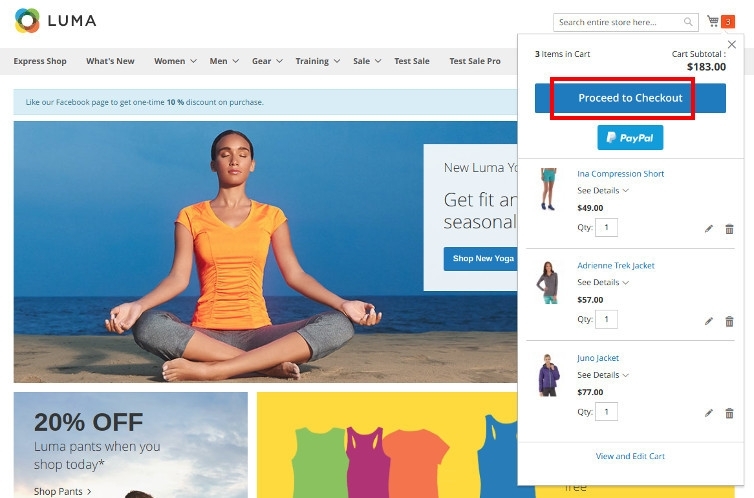 To save all card details for use in future transactions customers can through Magento Vault feature. 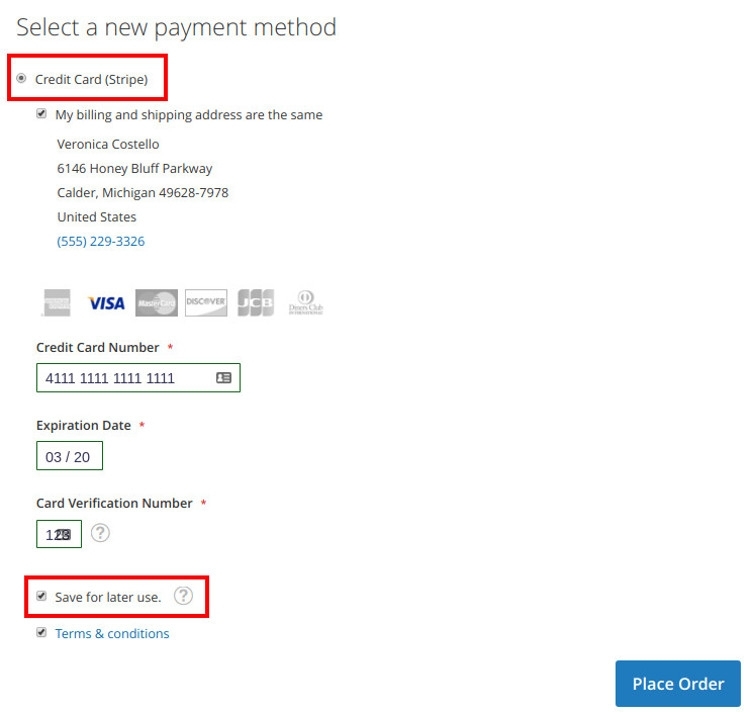 When completing the checkout process, the customers provide with the option to use already saved credit card data. Our module allows you to use two behaviour "Authorize" or "Authorize and Capture." Those are designed to help you to make the process of payment as comfortable and profitable as you want. More details about those two variants of payment methods you can read here: Difference between "Authorize" and “Authorize and Capture”. Such functions as void/cancel authorizations and expired authorizations are accessible in our Stripe Payments module too. Releasing the transaction before it been captured sometimes is a necessary step. It can be needed in many cases. The admin can process partial invoicing through our module. When authorizing payment after the customer makes an order, the administrator can choose a few products from an order for the invoice. After that, only part of the funds is available for a transaction. The remaining order amounts releases. Also, there is an opportunity to specify the different card types available for specific countries. Plus, Stripe Payments allows receiving payments from different countries in a variety of currencies. Veronica decided that she wants to upgrade the wardrobe, so she went to her favourite web store. Entered her account to create purchases. She filled the basket with all necessary and went to the checkout. She fills out all the necessary information and then chose the payment method Stripe. Typed her credit card number, card completion date, and verification code. Veronica wanted to keep the store information about her card for future use, so she ticked a mark on the field Save for Later Use. Then she clicked to Place an Order and received her purchases the next day. The next time she returned to make purchases in her favourite store she received a pleasant surprise. Veronica did not have to go and look for her card to fill the required fields. She merely chose her card associated with the account and quickly completed the online shopping process. On her Stripe account, Veronica immediately received a message of authorization her money for purchase on your site.